Charlotte Street in Fitzrovia, just a few minute's walk from Tottenham Court Road, and Goodge Street, is one of London's secret gems. Mostly known only to folk who live, work or study locally and a haunt of celebs, should a tourist stumble upon this wonderful street, they would indeed have struck gold. Lined with many restaurants and cafés, as well as numerous characterful period buildings, it oozes charm and atmosphere with a wealth of choice for eating, drinking, and being cool. We aimed for Siam Central for dinner, on recommendation of my good friend who has eaten there many times and wanted me to try EVERYthing. 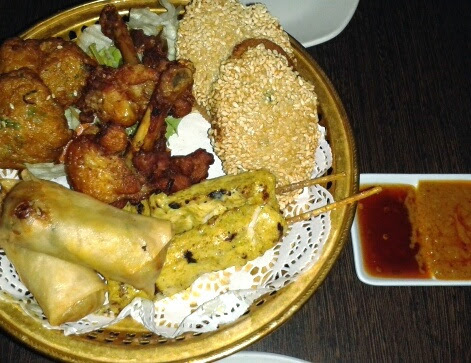 Happy to oblige, we started with the Siam Combo, a selection of traditional Thai starters, all of which were deliciously authentic - do ask for an extra dipping bowl though, so you can double-dip to your heart's content. The menu also features a 'tapas' menu, so if you wish you can choose starters all evening... hmm, tempting! Whilst we didn't quite order everything on the menu (could have...), we chose a dish from each section, each with a different meat. The star of the meal was the Massaman Lamb curry, a warming, rich curry with potatoes - yes you can take the girl out of Ireland but she still loves her spuds - with succulent pieces of lamb and a fragrant spicy sauce. Pad Thai, that benchmark for every Thai meal, was delicious and the butterfly prawns cooked to perfection. The pineapple rice was served in, what else?, half a pineapple, and was flavoursome and spicy with the sweetness of the pineapple chunks coming through. On the side, a chilli and aubergine stir fry which had sweet basil and soy beans with slithers of pork added an extra kick. And just in case that wasn't enough, we had some roti with a light chilli-infused curry sauce. Every mouthful of every dish was delicious. Ok, I'm biased as Thai is one of my very favourite cuisines, but still. Can't fault the food here. No booking required, though we waited about five minutes to be seated. Then we got the window seat which would be perfect if you were celeb-spotting. Which we weren't. The staff were polite although the two main men could have cracked a smile - Thailand is, after all, the land of Smiles, and rightly so. If I could eat Thai food every day, I sure would smile more. As we ventured out into the night (with enough leftover food for several days' lunch) we stumbled upon a basement cocktail bar called Bourne and Hollingsworth, definitely worth a visit for The Gatsby. Appropriately named. Charlotte Street, I will be back. Sounds wonderful - really craving those flavours right now! 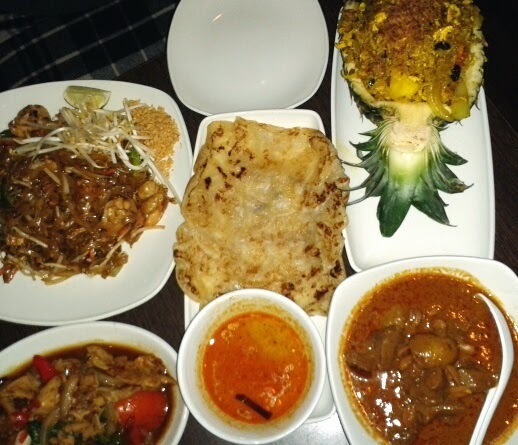 Wow I adore Thai food and there aren't many restaurants near me. I love Masserman curry so would have that or Thai green curry. Thanks for a lovely review. Thanks Melissa, it's one of my favourite cuisines too.